My best friend and I have always been tea-lovers, so I guess it's about time that we finally attended an afternoon tea service together. 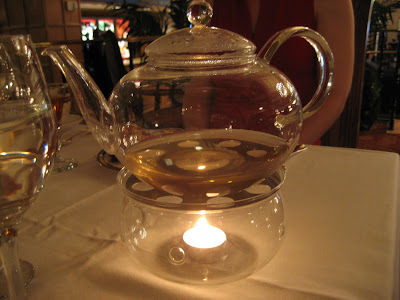 After doing some research online, I discovered that the Boston Park Plaza's Swan's Cafe employs a very gifted Tea Sommelier named Cynthia Gold. Also, with appointment only, one can partake in a private tea tasting, free of charge, absolutely included in the price of the regular afternoon tea! My mind was made up. This is where we were going. 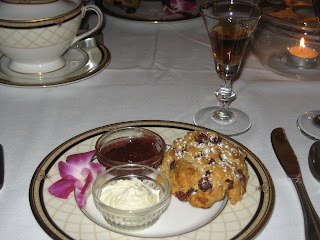 Foodwise, our meal started off with a dried cranberry scone, Devonshire cream, and strawberry preserves. Very tasty! We were also offered a small shot of port wine infused with black tea and lavender. Very unique and tasty as well. We both had opted for the traditional choice of sandwiches (as opposed to seafood or vegetarian), which included egg salad, chicken salad, spiced pork with mango, and smoked salmon. They were presented more like mini toasted open-faced French-style tartines as opposed to the traditional untoasted crustless sandwiches. They were very good, but obviously not the highlight of the experience. Neither were the sweets, which were at times a bit too sweet, especially the strawberry petit four. 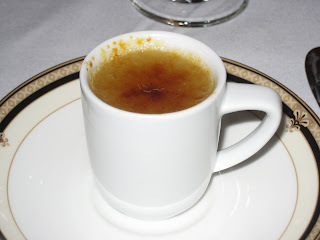 Finally, an Earl Grey-infused creme brulee, which surprisingly reminded me of marshmallows. Enjoyable? Yes. Although the food was good, we were there for another reason entirely... on to the teas! We were offered 6 teas to taste, plus one special "birthday" surprise tea for my wonderful friend whose birthday we were celebrating. 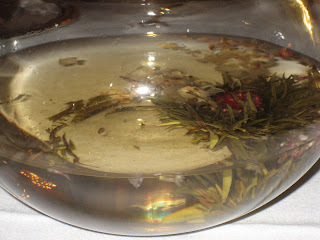 It was a small tea ball that we dropped into hot water and watched it open and bloom as it steeped. Very pretty and tasty as well, with jasmine flowers and the Chinese version of a clover in addition to the white tea leaves. Cynthia Gold is a wealth of knowledge. We so enjoyed hearing all of her amazing stories! She also had answers for every single question we asked her, and let me tell you, there were lots!! Thank you so much for this wonderful, one-of-a-kind experience. We'll definitely be back!! 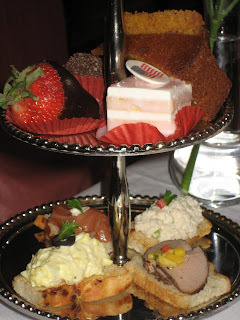 My friend and I love to attend high teas as well but our favorite place decided to close after 10 years :( We'll have to find another place here in the Twin Cities but have not found it yet. I have 3 of those glass teapots of different shapes and that tea light. Love done those wonderful blossoming tea balls. Thanks! I am sure you'll find someplace, there's always new places opening up :) I personally LOVE the Duck and Bunny which just opened this year in Providence. 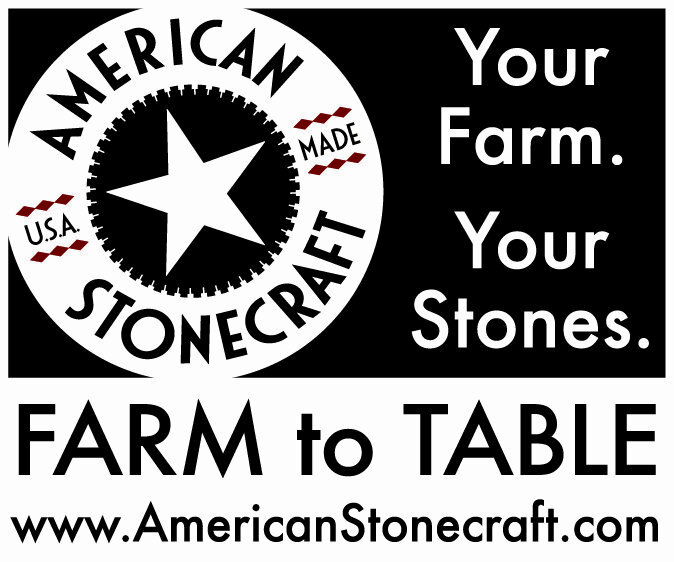 If you're ever in the area, it's wonderful and very reasonably priced!